Hello Friends! I hope my US readers had a wonderful Thanksgiving yesterday. Ours was a small family affair with my sister and her husband and our parents. Three dogs livened things up and we had a long time to relax and chat. We saw only a few snowflakes, but lots more rain. I was born on Thanksgiving, so we always celebrate my birthday on the holiday even when my actual birthday is next Monday. Birthday pie is a tradition! I have been busy with house and family this week, but have been squeezing in a bit of time to update my shops since the Christmas Goose Fair last weekend. I still have a few more of the hand stamped cards to add, but mostly the shops are as full as they will get for the holidays, unless I get a wild hair to finish items already in progress or start something new. Lucky for you, the Etsy Cyber Week Sale is on now until Monday, November 26th. Purchase at least $50 and get 20% off. This includes everything in both shops including drawstring bags, zipper bags, handmade books, original art, ornament kits, Christmas ornaments, Christmas cards, everyday note cards and stickers, and hand stamped Moleskine journals. Unfortunately, with the way Etsy works you can’t combine items from the two shops to make up the $50, but hopefully you can find goodies in either shop to get there. No coupon needed! My one and only holiday art fair this year is the Christmas Goose Holiday Fair this Friday (9-6) and Saturday (9-4) at St. Charles Hospital, Bend. As most of you know this fair is a fundraiser for Wendy’s Wish which provides non-medical support to cancer patients in the area. As a two time cancer survivor, it’s very close to my heart. I am unable to do the Holiday Tails Art Fair this year, but hope to be back there in 2019. I have been getting together a wonderful collection of items: handmade and printed note cards, original watercolor and acrylic paintings, hand painted and stitched ornaments, my embroidered ornaments kits for you to DIY, and lots more. I’ll also have some of my linen drawstring pouches and zipper bags, a Christmas stocking and a Christmas quilt. The newest items are the hand stamped note cards (both Christmas and everyday) that are made from my hand carved stamps. Each one is a little different. 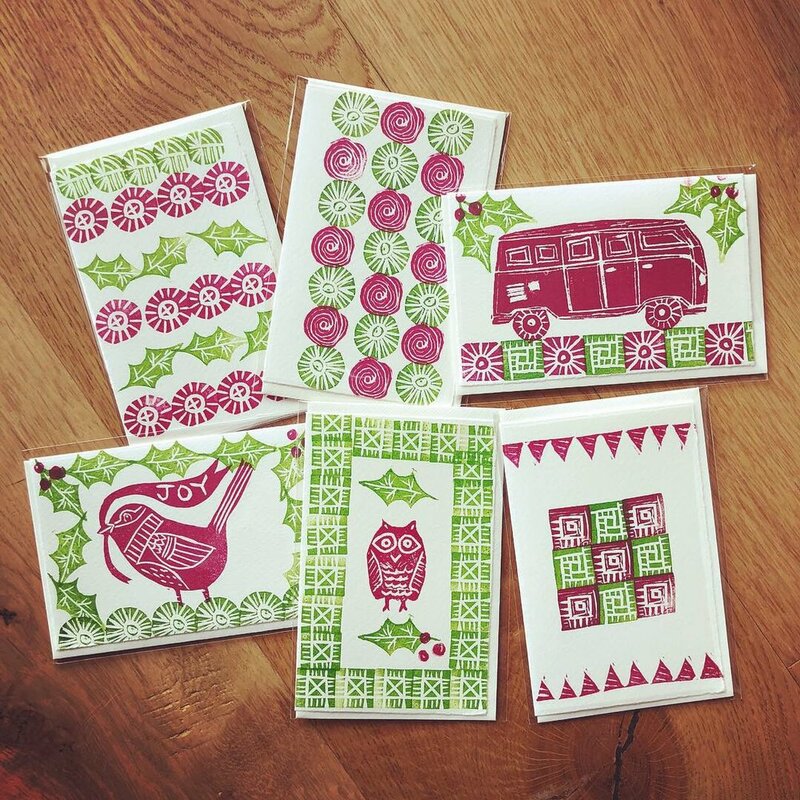 I’ll also have lots of printed Christmas cards and everyday note cards, stickers, note card sets and much more. I hope to see you there! If you can’t be there I am planning to keep the Etsy shops open and see how that goes. If things get crazy I may shut the shops down for Friday and Saturday, but they will reopen as soon as possible. If you want to be sure to get something before it sells out, both shops are open currently. Thanks so much! I decided to pop these three art quilts into the shop. Each is an original work of art, 12” x 12”, includes a hanging sleeve, and is ready to add a little color to your home. My handy-dandy raffle picker (aka Ryan) was pleased to choose two winners of the Curated Quilts Calendar raffle. Congratulations to Beth and Bobbie! Bobbie, please contact me with the contact page on this blog and send your mailing address so I can get yours sent off tomorrow. I had such fun reading the comments in the last post. The thing that struck me is that there was so much variety in the responses. I often think I’m guilty of being all over the place when it comes to making stuff, but apparently everyone likes something a little different anyway. Thank you all for playing along with this little game. I appreciate every single one of you! Oh happy day! I am so pleased to have my quilt, Las Ventanas, in the new 2019 Curated Quilts calendar. This lovely calendar is printed on the same matte finish paper as the CQ magazine and is constructed in such a way that the quilt photos can later be cut out and framed if desired. See more calendar quilts or purchase one here: Curated Quilts Magazine. My copies have finally arrived and I’d like to giveaway two of them to two lucky winners. If you would like to be in on the giveaway, please comment once below and tell me what is your favorite item in either of my shops. The giveaway is open to US destinations only. Feel free to let your friends know about the giveaway. Comments close on Thursday at 5 pm (Pacific time). I will be choosing two names from the hat on Thursday night so I can ship on Friday. I will be going on vacation next week, so final shop orders will also go out on Friday. Thanks and good luck! **** Please note, I have no way to contact you directly from Squarespace. If you enter the contest, please put your email address in the comments separated by spaces (ie- name @ gmail.com). OR, if you prefer to keep your email private, be on the look out for a blog post Thursday evening. If I don’t hear from the winners by 8 pm Thursday I’ll have to choose other names. Thanks!